Rev. Joseph M. Gleeson 1897-1902 founder St. Michael Church on Thomaston Ave. The Right Reverend Bernard O'Reilly had been installed as bishop in 1850 and, at that time, there were only five churches and seven priests in Connecticut. The great influx of immigrants, especially from Ireland during the great famine of 1846, increased the demands for services even in country districts. Such a demand took inception in Waterville as early as 1854 when John McCarthy, the first known Irish settler in Waterville, took up his residence here, to be followed soon after by Charles Shepley and Hugh O'Donnell. It was necessary for these early settlers to attend mass and receive the sacraments at St. Peter's. And so it continued until 1896 when the Rev. Joseph M. Gleeson was appointed pastor of St. Patrick's in the Brooklyn section and Waterville was transferred to him as a mission. 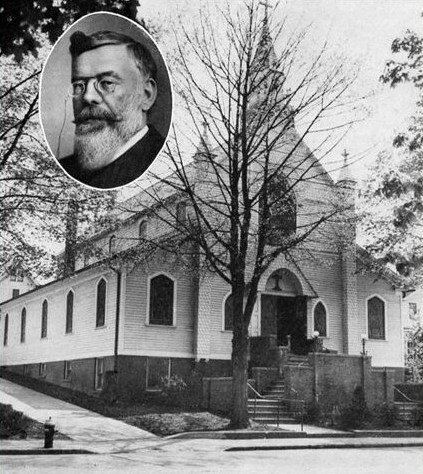 Father Gleeson came to Waterville and celebrated the first public mass here on January 19, 1896, in Ford's Hall at the corner of Thomaston Avenue and Chapel Street. Only a small group of pioneers participated in that historic event - the proverbial mustard seed. Father Joseph M. Gleeson then purchased land for a mission church on Thomaston Avenue from James Coughlin and Patrick Thompson. Sunday Mass was offered in Ford’s Hall until the church was ready. The cornerstone was laid by the Right Reverend Michael Tierney, D.D., on Sunday, June 20, 1897, and on Sunday, August 8, 1897 it was dedicated by the Bishop in honor of St. Michael the Archangel. It is interesting to discover from the parish records that the first baptism in the new church was performed on the day of its dedication-Margaret Maher, child of James Maher and Catherine Lawless, was baptized by the Rev. James Lawless. After the ceremony of the Mass, the Bishop robed for the ceremony of the first Confirmation in St. Michael's Church. Seven young people were confirmed that day. The first marriage recorded took place on January 8, 1898, when Father Gleeson joined in holy wedlock Patrick Cantillon and Mary Allman. On March 25, 1902, prodigious growth led to the conferring of parish status, as Bishop Tierney named Father Matthew J. Traynor as the first pastor of St. Michael’s parish. Elmer J. Chatfield and Andrew Hersam were selected as trustees. 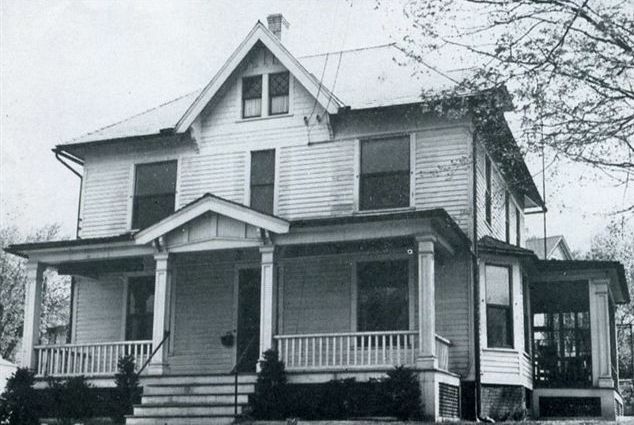 A rectory was built in 1903. In 1907, the pastor formed a women’s Altar Guild and a men’s Holy Name Society, both of which became dynamic sources of parish development. Father Traynor also renovated and rededicated the church. In 1917, Rev. David O’Donnell became second pastor, as World War I stimulated local industries and swelled the parish roster. A series of capable pastors followed, each making his inimitable contribution to the St. Michael parish saga. These fine priests included: Rev. William J. O’Shea (1926), Rev. Michael Keating (1934), Rev. Francis C. Higgins (1938), Rev. Robert H.Falls (1941), Rev. James J. McCormick (1944), Rev. Joseph T. Cunningham (1949), and Rev. Francis J. Barrett (1958). In 1963, English-born Rev. Alban F. Keeley was named pastor. Recognizing the compelling need for a larger church, he mobilized his traditionally spirited congregation to mount a building fund drive. The spectacular financial result, saluted with a parish victory dinner, soon enabled a groundbreaking ceremony on October 11, 1964. 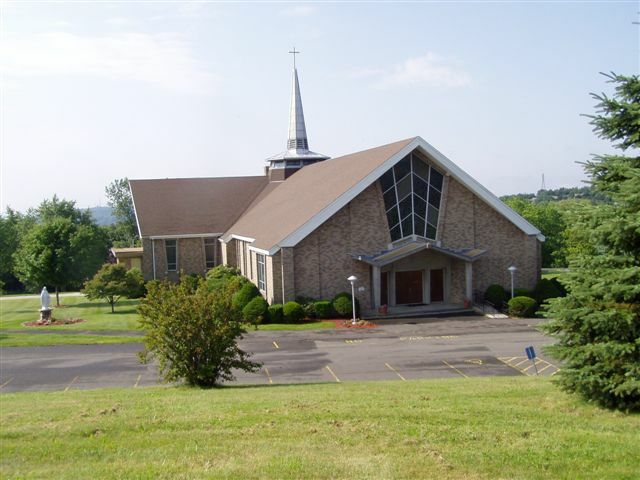 On August 21, 1966, Auxiliary Bishop John F. Hackett dedicated the new parish church and rectory on St. Michael Drive. 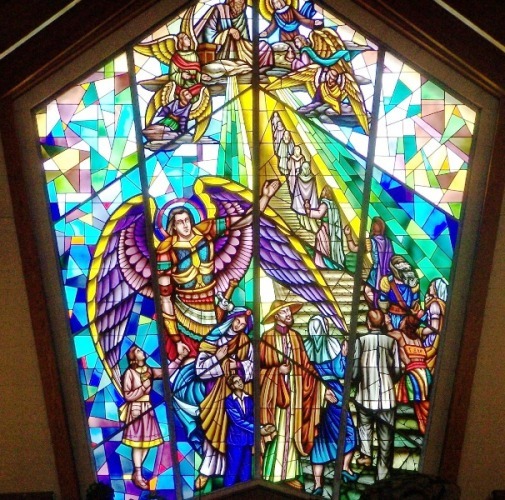 Father Leonard Goode delivered a memorable homily for the occasion that highlighted the joy of that day as beautifully as the new temple’s brilliant stained glass. Franciscan Rev. Francis A. Hanudel, O.F.M. was appointed pastor in 1986 upon Father Keeley’s retirement. At the same time, he was also pastor of St. Thomas Parish. In 1989, Rev. Simeon Distefano, O.F.M., became pastor of both parishes and remained in that capacity until July 1, 1996, when Rev. Ronald Gliatta, O.F.M., assumed the spiritual leadership of both parish communities. 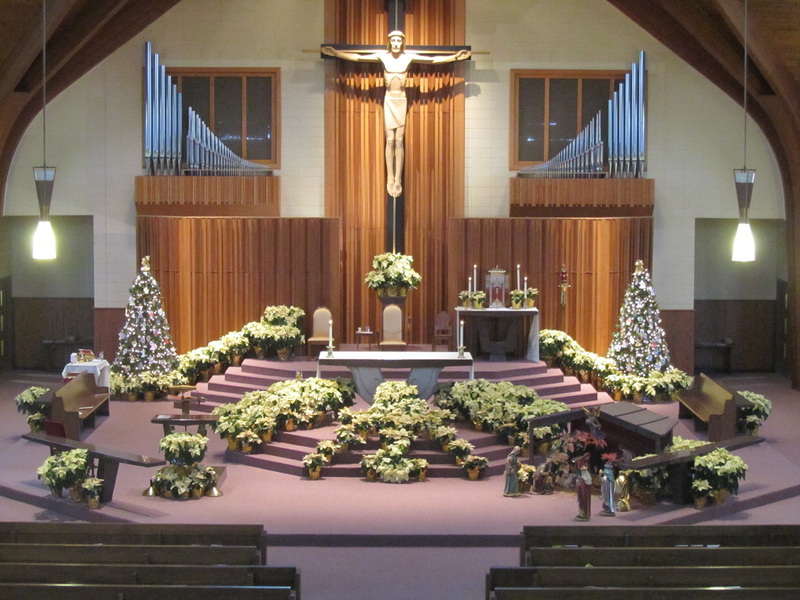 One year later, in 1997, St. Thomas Parish was closed by the Archdiocese and joined permanently to St. Michael’s. Fr. Ronald and the community of St. Michael welcomed their new parishioners with open arms. Fr. Ronald remained as pastor until June of 2009 at which time Rev. Roger Hall,O.F.M. was assigned to minister to about 1,000 households and work together in the interest of the parish’s proud chronicle of Christian accomplishments in Waterbury. The Franciscans withdrew from the administration and leadership of St. Michael Church effective May 1, 2012. The Friars had served faithfully the needs of the good people of St. Michael's for 26 years. 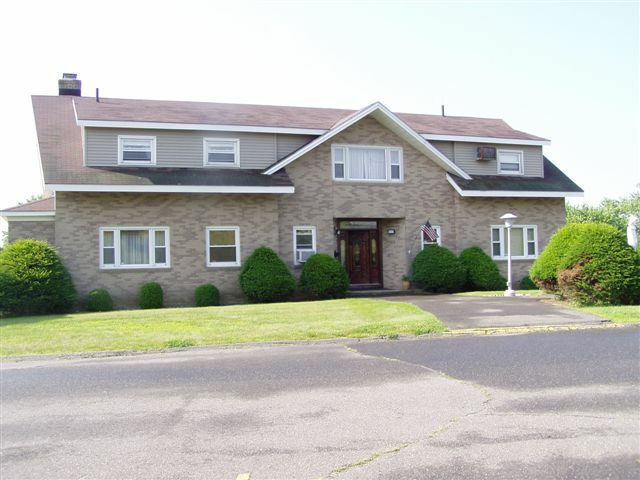 The Immaculate Conception Province, like so many other Religious Orders and Diocese, was having difficulty with having sufficient personnel to adequately staff all of their provincial commitments. Reverend Nathaniel C. Labarda, of the Archdiocese of Hartford, was appointed administrator of St. Michael Church in June of 2012. In March of 2013, Rev. Nathaniel C. Labarda, was appointed Pastor of St. Michael Church. Today, St. Michael’s is considered by many in Waterbury to be among the leaders in the spiritual life of the city.